With a suite of global trade conflicts seeming to worsen by the day, investors are acknowledging that we could be heading into a period of serious disruption, and by this, they are scouring their portfolios for opportunities to protect themselves. One area that has received attention is Small Capitalization U.S. stocks. Some think it’s a safe bet, but the data tell us otherwise. The attraction to small-cap stocks is simple and seductive, the rationale being that because smaller companies have less exposure to international markets, they are better able to withstand fluctuations in global trade. Small-caps usually have less revenue coming from abroad and depend less on global logistics and supply chains. Therefore, the logic goes, they are a safe harbor for investors during times of trade uncertainty. While that thinking has some merit, it ignores some critical facts, not least that small-caps actually import more as a percentage of sales than large-caps. And when we break open this investment strategy and look closely at the Russell 2000 (the main U.S. small-cap index of about 2,000 stocks), we find two primary reasons for prudence: over-valuation and debt. As of late 2017, more than one-third of Russell 2000 firms didn’t have any earnings at all; they actually lost money. That number may have improved with the recent changes to U.S. tax law, but it’s still a staggering amount that calls into question the health of a large number of these companies, and by extension, what they are actually worth. If investing is about comparing the price you’re paying for the value you’re getting, the Russell 2000 is extremely expensive. 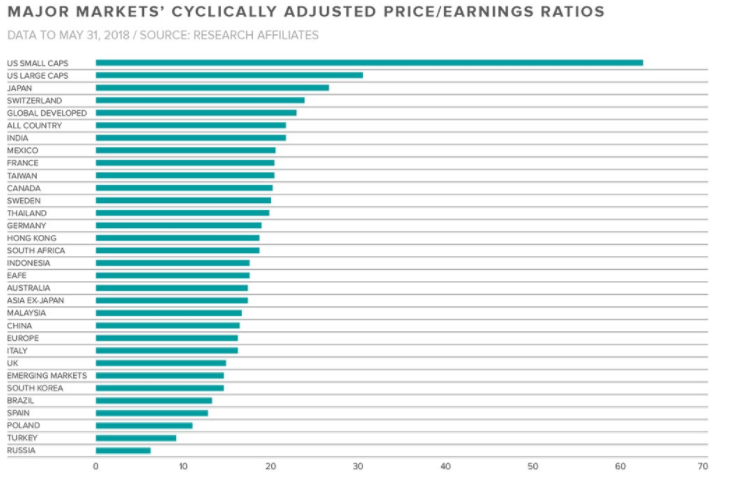 The current price-to-earnings ratio (P/E) is a whopping 72.96x earnings. If we think of that number as a single business, the market is asking us to pay almost $73 million dollars for a company that generates $1 million a year. To be sure, some businesses historically have grown so fast that they might be worth the super-rich price tag, but we’re talking about 2000 companies and so the law of averages plays out. The following chart compares U.S. small-cap’s cyclically adjusted P/E relative to other U.S. stocks and international stocks. Nothing else even comes close. The second issue with the Russell 2000 is the foundation upon which it’s built, and the current amount and type of small-cap debt is worrisome. 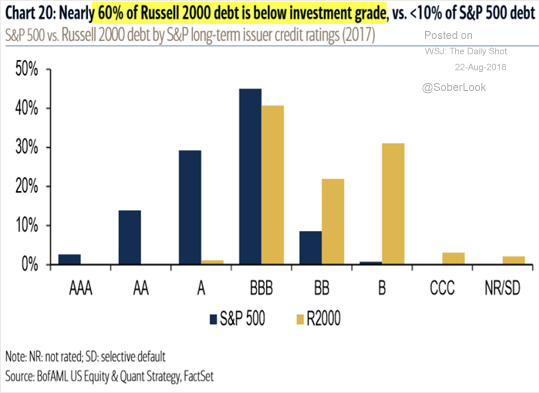 Nearly 60% of small-cap debt is graded as junk, and almost all other small-caps in the Russell 2000 are rated BBB, which is one notch above junk. 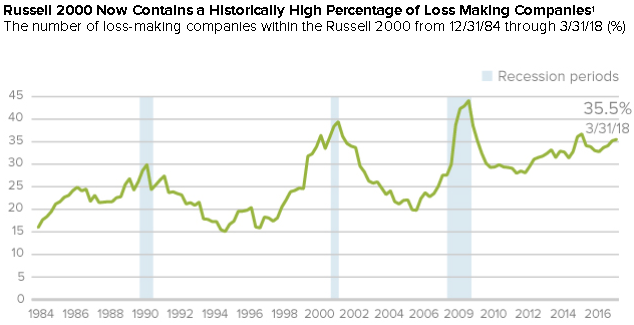 The chart below shows there are virtually no “high quality” firms in the Russell 2000. But it’s not just the low quality of debt that is concerning; it’s also the volume. 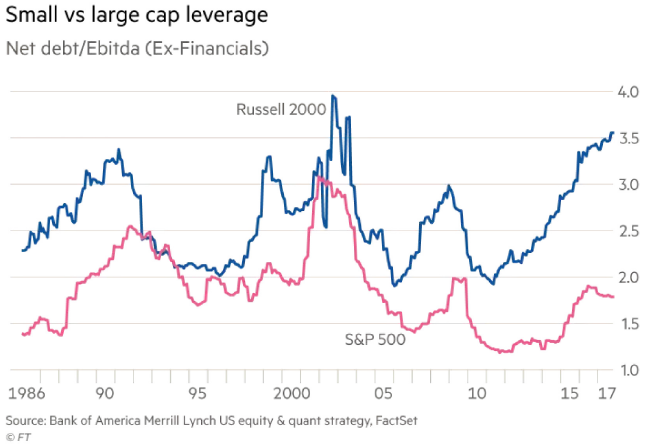 Consider this chart demonstrating how much debt Russell 2000 firms have relative to EBITDA (a popular measure of cash flow). As you can see, small-caps have almost double the debt of S&P 500 firms. These debt levels indicate Russell 2000 companies are depending on the “kindness of strangers;” that is, if lenders become spooked by trade-war rhetoric or worsening economic conditions, the companies in the Russell 2000 will either have difficulty funding themselves or they’ll fund themselves at a much higher cost. 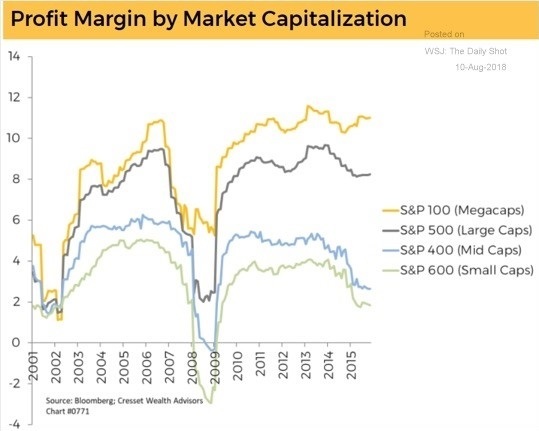 And since small-cap profit margins are the lowest by market capitalization, as the chart below reveals, they are far less resilient in times of trouble. For the sake of argument, if we take an optimistic view and imagine a scenario in which the economy continues to do well, and the Fed steadily returns to normal interest rates, it would also hurt small-caps disproportionately. This is because about 40% of small-cap debt is floating. If the Fed continues to raise rates as planned, it will naturally and quite immediately levy higher interest costs to small-cap firms. And if the current economy, operating with a tight labor market, were to surprise us with a hotter-than-expected inflation number at any point, such that the Fed felt obligated to be more aggressive, that could speed up those costs beyond what investors are expecting today. Bottom line: If you are looking for a “safe” asset class to invest your capital during what looks to be an increasingly troubling future, look somewhere else. Disclosures: The author has used ProShares Short Russell 2000 as a small hedge to his equity portfolios. The prices of small company stocks generally are more volatile than those of large company stocks. The performance of an unmanaged index is not indicative of the performance of any particular investment. The performance of an index assumes no transaction costs, taxes, management fees or other expenses. Past performance does not guarantee future results.